Get 6 months to pay $790.00 with PayPal Credit! No payments + no interest if paid in full in 6 months. 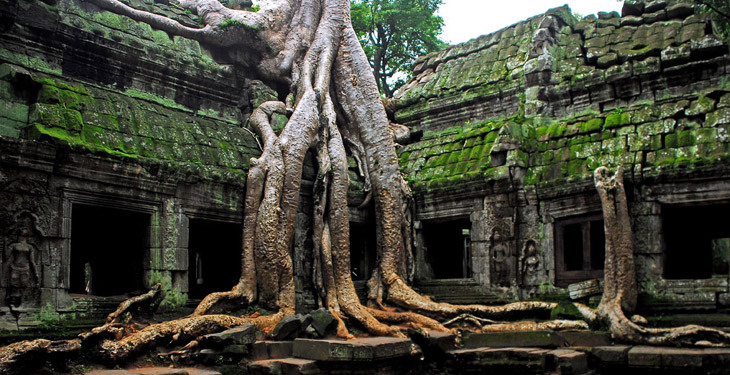 Discover the natural beauty of Vietnam and Cambodia. 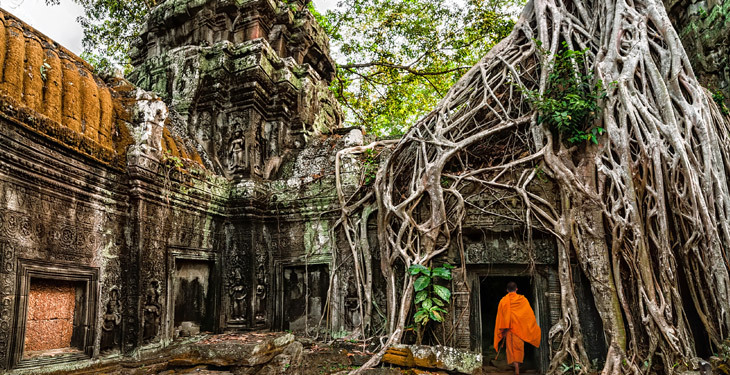 Spend 11 days traveling from Hanoi, Vietnam to Siem Reap, Cambodia, stopping at all the main highlights in between. 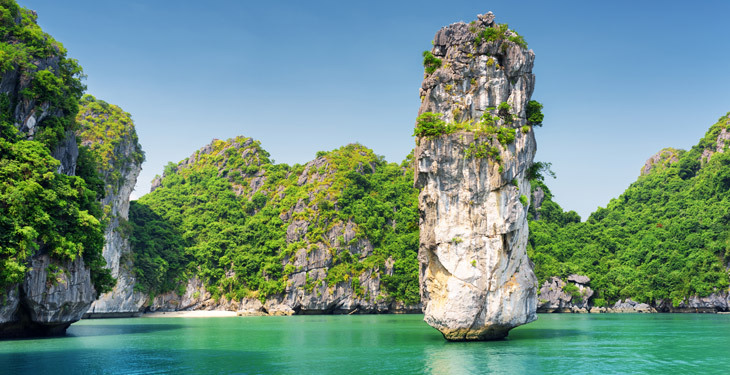 Depart from Vietnam's capital city of Hanoi and head to the famous granite islands of Halong Bay. Spend two days cruising the bay, exploring Titop Island, swimming, kayaking, and participating in cooking classes. Continue south to the Mekong Delta and experience local floating markets at Cai Be. Feel history come alive by visiting the Cu Chi Tunnels; the immense underground system that once covered over 137 miles from Saigon to the Cambodian border. Once you've made your way through Vietnam, you'll travel by bus and private car to Siem Reap, the gateway to the famous ruins of Angkor. The peaceful rural rice paddy scenery is a sight not to be missed. Spend the afternoon exploring the incredible architecture structure of Angkor Wat Temple, the largest religious monument in the world. As time winds down in Cambodia, watch the sun fade into the horizon at the spectacular multi-tiered temple of Bakheng Hill. A representative from Go Asia Travel will pick you up from the Noi Bai International Airport (HAN) and transfer you to your hotel in Hanoi Old Quarter. Depending on your arrival time, enjoy an afternoon exploring Hanoi. In the morning, transfer to Halong Bay. After lunch you'll board the Halong Bay cruise and spend the afternoon exploring the bay the right way. Kayak, relax on the boat, visit Titop Island, swim the crystal-clear waters, and take a traditional Vietnamese cooking class. After breakfast, you'll visit the fascinating Sung Sot Cave ("Surprising Cave"). Enjoy lunch aboard the Halong Bay cruise, and take a flower carving class before transferring back to Hanoi. Today you're free to visit the Hanoi Old Quarter. In the afternoon, you'll fly to Ho Chi Minh City. Transfer to Cai Be and enjoy views of the flat rice fields over Tan An. Take a boat tour of Cai Be Floating Market and experience the vibrant boats and people exchanging goods, fruit, and many other commodities as they float their way down river. You'll spend the rest of the day roaming around small villages to visit orchards and fruit plantations. Keep cruising to Vinh Long through small canals and enjoy the charm of the Upper Mekong Delta as you visit small family businesses and get a closer glimpse of Vietnamese culture. Transfer to Cu Chi early in the morning. Located 40 miles from Ho Chi Minh City, Cu Chi is now considered a heroic district for its role in the Vietnam War. It is legendary for its underground tunnel systems that stretched over 130 miles. The peaceful, rural rice paddy scenery contains ducks and water buffaloes swimming in the rivers alongside the road. Visitors will find it hard to imagine the widespread destruction, damage, and defoliation of the area caused by bombings and mines when Cu Chi was "A Free Target Zone." Today you'll transfer by bus to the Moc Bai border gate to enter Cambodia (a 6-7 hour bus ride). You'll get a visa on arrival with the help of a bus crew (on request) to gain entry into Cambodia. Upon arrival, transfer to your hotel in Phnom Penh - King Grand Boutique Hotel. 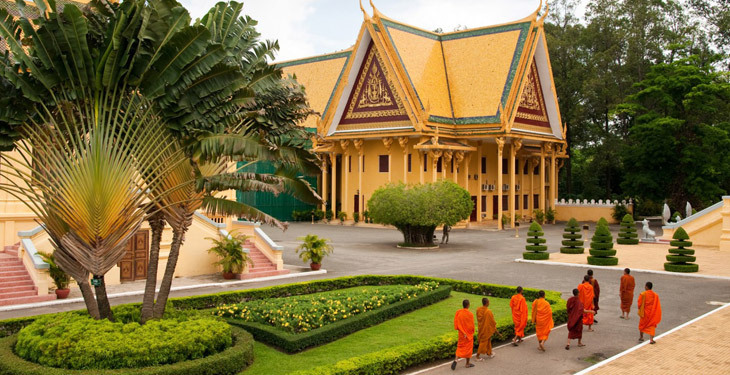 Take a private tour to visit the Tuol Sleng Prison Museum and the notorious Killing Fields of Choeung Ek, which will give you a deeper insight into the painful and bloody rule of the Khmer Rouge. In the afternoon, explore Psar Tuol Tom Pong, also called the “Russian Market," where anything and everything is for sale. Before returning to the hotel, enjoy a scenic hour-long boat cruise on the Mekong River. Transfer by private car and then take a bus to Siem Reap (a 6 hour drive), where you'll check in to your hotel in Siem Reap - Claremont Angkor Boutique Hotel. After breakfast, transfer to Angkor Thom area to visit Ta-Prom Temple. 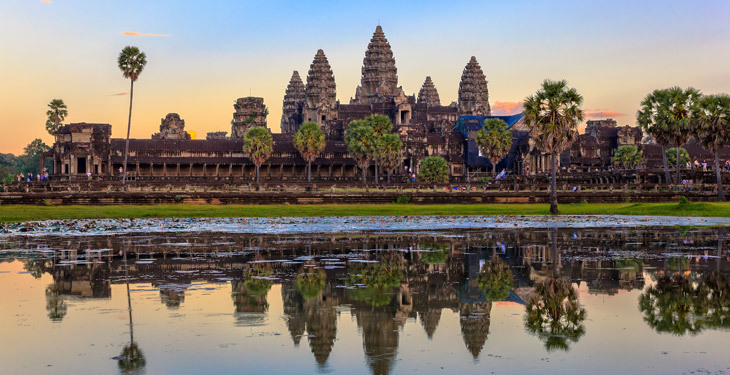 Continue onto the magnificent Angkor Wat Temple, built between the 9th and 13th centuries and one of the seven greatest architectural wonders of the world. Enjoy one last picturesque sunset over Bakheng Hill. After breakfast, transfer to Siem Reap-Angkor International Airport for your departure flight home. Go Asia Travel in Vietnam offers private tours and group joining tours in Vietnam, Cambodia, Myanmar and Laos. Tours include selective day trips, hotels, cruises, transfers and hospitable guides to the best sightseeing spots. Go Asia cares about your trip and always acts in a professional and friendly manner that is recommended by all valuable guests. Always delivering on their promises and acting responsibly with the natural environment and local communities, Go Asia Travel provides the best value for your budget. They aim to provide guaranteed satisfaction and are licensed as an International Tour Operator Company who can organize tours for travelers all over Vietnam and the world. Our recent 14-day tour with Go Asia Travel was almost too good to be true - it was everything the itinerary promised and we congratulate the company for their wonderful organization of all the travel, accommodation, tours and cruises we experienced. Mike from Go Asia met with us at our hotel in Hanoi prior to our tour starting and provided us with plane and train tickets, in addition to extra information on our itinerary. At every destination (Hanoi, Hoi An, Saigon, Phnom Penh and Siem Reap) we were met by a driver and taken to our hotels (all excellent drivers and great accommodations at Maison d’Hanoi Boutique Hotel for 3 nights, Vinh Hung Library Hotel in Hoi An for 2 nights, Elios Hotel in Saigon for 3 nights, King Grand Boutique Hotel in Phnom Penh for 2 nights and the Claremont Angkor Boutique Hotel in Siem Reap also for 2 nights). Only one driver didn’t turn up at the railway station in Danang and we were promptly reimbursed by Go Asia Travel for our taxi fare to the hotel – thanks Ms. Ruby. The staff at each of these hotels were very friendly, helpful and professional. Special mention to Sao, Wendy and Rosaline at Maison d’Hanoi Boutique Hotel and Sona Yan at the Claremont Angkor Boutique Hotel who looked after us. We had breakfast in every hotel, and lunch was provided at a local restaurant on every tour. Our tour guide to My Son Holyland was very entertaining and informative. Mr. Hai was our tour guide for the Mekong Delta tour – another entertainer with so much knowledge! For the Cu Chi Tunnel tour our guide was Jackie who once again was full of information and gave us lots of laughs. The bus ride to Cambodia took over 6 hours – every driver during our trip was very skillful considering the traffic congestion! The next tour guide was Mr. Lee (Ly Malayana) who took us to the ‘Killing Fields’ and S-21 Prison in Phnom Penh (a very sobering experience where we met a survivor, Mr. Chum Mey). In Siem Reap we were guided by Mr. Ny Danith who took us to the temples, an amazing experience. Our excellent driver around Siem Reap was Mr. Sopheap – thanks, you are an incredible driver. In every way Go Asia's Best of Vietnam and Cambodia was superb – we’re already recommending it to friends and family – thanks so much for a fantastic trip we'll never forget. There is a 2 person minimum per departure date. Departures available everyday. Voucher valid through 12/31/19. High season surcharge applies on certain dates (see FAQ). 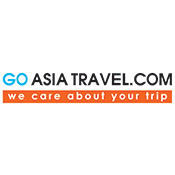 Do not make travel arrangements until you receive confirmation from Go Asia Travel. How do I redeem my voucher? For which dates is it valid? Are there high season surcharges? Please note there is a 2 person minimum per departure date. To redeem your voucher, simply reach out to the operator as instructed in your confirmation email, and be sure to provide your order number. Voucher is valid until December 31, 2019. Fly into Noi Bai International Airport (HAN) in Hanoi, Vietnam. A representative from Go Asia Travel will be there to pick you up from the airport and transfer you to the hotel in Hanoi Old Quarter. Please note that the trip ends in Siem Reap, Cambodia. Please plan your travel arrangements accordingly. Accommodations are based on double occupancy. You'll be staying in top recommended 3-star hotels in the city center. If you're a solo traveler, there is a single supplement fee of $425 to be paid directly to Go Asia Travel. Vietnamese food is amazing, and you'll enjoy a variety of regional specialties during your time abroad. Dietary restrictions can be accommodated, but please notify Go Asia Travel in advance so proper arrangements can be made. Go Asia Travel recommends budgeting $280 for meals and other expenses not included in the itinerary. Yes! Travel can be extended in any of the following cities: Hanoi, Ho Chi Minh City, Phnom Penh, or Siem Reap. To extend travel, please contact Go Asia Travel directly. Additional fees may apply. Book confidently with Free Cancellations within 72 hours of booking. After 72 hours, cancellation fees will apply. Cancellations are subject to the full discretion of Go Asia Travel. For more information on our Travel Cancellation Policy please Click Here.